Acupuncture, chiropractic and massage therapy are popular alternative treatments for horses. While there have been many breakthroughs in equine health using traditional, Western medicine, many owners are also looking for ways to sustain and enhance their horse’s health without the use of pharmaceuticals. Three common methods of alternative care that have been moved more prominently the forefront of equine health include acupuncture, chiropractic and massage therapy. 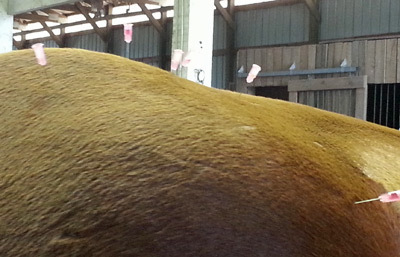 Interested to see if these treatments might help your horse? Read on. Acupuncture seeks to treat disease by stimulating specific points along the horse’s body to correct energy imbalances; this stimulation for equines is traditionally done using needles. Though used to treat a wide variety of ailments, it is most commonly used for pain relief in conjunction with other modalities. The acupuncturist must select the proper points to provide relief, insert needles at a correct depth and leave them in for the correct amount of time. Acupuncture really gained traction as an effective equine treatment in the West in the 1970s, thought it has been only in the last 15 to 20 years that it has gained more acceptance as a treatment option, notes Dr. Rodgers. 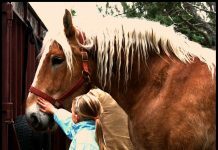 acupuncture to horses in the United States. They can gain certification in a few ways, including short courses (2 to 3 days) that give a certificate of completion, or completion of four to five, week-long modules at The Chi Institute or the International Veterinary Acupuncture Society (IVAS). These more-intensive courses of study will require a vet to complete a final practical and written exam in order to pursue certification. Currently, a veterinarian need not be certified by one of these agencies to practice acupuncture. Dr. Rodgers notes that acupuncture can be used to treat a range of equine ailments, including musculoskeletal injuries or diseases (muscle strains, neck or back pain), as well as reproductive issues (such as urine pooling in mares, retained testicles and infertility), hormonal and metabolic imbalances, and internal physiological imbalances (like exercise-induced pulmonary hemorrhage). Though helpful for many ailments, there are some instances where acupuncture is not helpful; these include acute fractures and surgical abdominal crises (certain colic cases). Your veterinarian should always try to choose the best treatment with the least complications, Dr. Rodgers reiterates. While generally safe, acupuncture can be potentially harmful because of needle positioning and length in certain areas of the body. “Knowledge of equine anatomy is an absolute must when practicing acupuncture,” says Dr. Rodgers. Chiropractic adjustments, like acupuncture, are an alternative therapy commonly used in conjunction with traditional Western medicine. This manual manipulation of the body encourages it to heal without utilizing surgery or drugs. The chiropractor, also a professional very familiar with equine anatomy, applies pressure via a thrust to a particular joint to treat areas where the horse is “out” (or has a subluxation) throughout his body. While practiced for centuries in both Greek and Chinese cultures, its modern application has developed in the last century and, like acupuncture, has only recently become widely accepted. A horse who has musculoskeletal issues (usually involving the back or neck), or one that has gait abnormalities, can usually benefit from chiropractic care. Traditionally horses who need chiropractic care may have behavioral issues, have trouble with impulsion or collection, and may exhibit signs of stiffness or changes in way of going. Some horses in need of chiropractic care may have visible muscle atrophy. While it may seem unlikely that a horse could be physically manipulated by a human, remember that chiropractic treats one joint at a time, testing each for range of motion and flexibility before being adjusted. To practice equine chiropracty, a person must either be a licensed veterinarian or have a Doctor of Chiropractic degree (DC) and practice under the direction of a vet, though this law can vary state to state. As riders and owners become more aware of issues such as bit comfort and saddle fit, they also are becoming more open to modalities to make their horses more comfortable that are not practiced by veterinarians. One of these methods is massage therapy, which does not require the therapist to have a degree. The masseuse uses his or her hands, fingers and elbows to manipulate the soft tissue to loosen tight muscles, joints and tendons, as well as to increase blood flow and reduce stress. Massage has also been touted to loosen scar tissue and reduce edema. Massage therapy can provide “variable degrees of relief, depending on the primary problem, says Dr. Rodgers. “But it can be a help diagnostically if the massage therapist is experienced.” The massage itself is limited by the depth of muscle relaxation a masseuse can achieve, but massages are helpful in cases of muscle strain and muscle fatigue secondary to other primary sources of pain, notes Dr. Rodgers. Unlike chiropractic care and acupuncture, massage therapists do not need to be a vet or have a degree to practice massage, but in some states they must be under the direct supervision of a veterinarian. “There is very little potential for harm with a good therapist,” says Dr. Rodgers. While chiropractic care, acupuncture and massage therapy were not common 10 to 20 years ago, it’s now quite easy to find horse owners who regularly supplement traditional Western medicine with these modalities in an effort to keep their equine partners as happy and healthy as possible. “Often you achieve the best and most prolonged relief combining these in a treatment plan,” concludes Dr. Rodgers. Many riders are willing to forgo these feel-good options for themselves in an effort to ensure their equines are feeling their best!